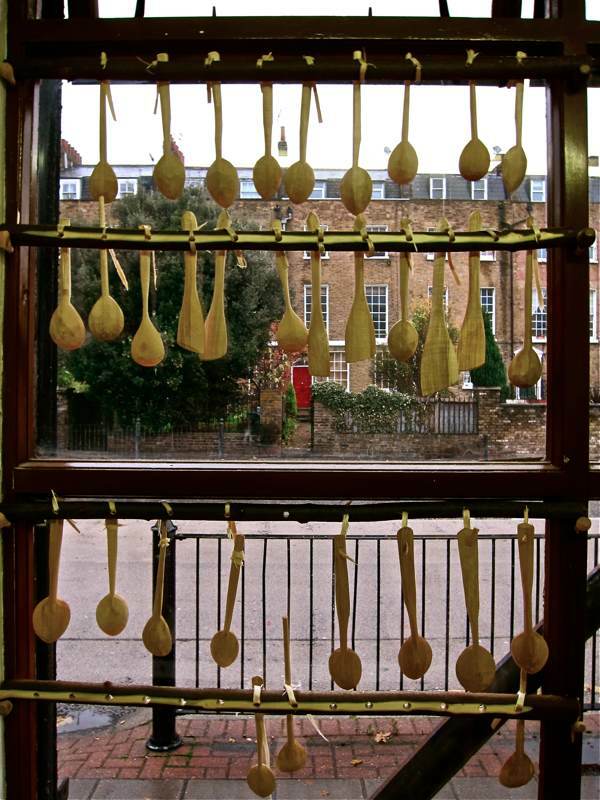 Barnaby Carder – widely known as Barn the Spoon - sits in the window at 260 Hackney Rd carving spoons for eight hours at a stretch. He sees the rush hour go one way and then he sees the rush hour go the other way, and in between friends pop in for a chat. 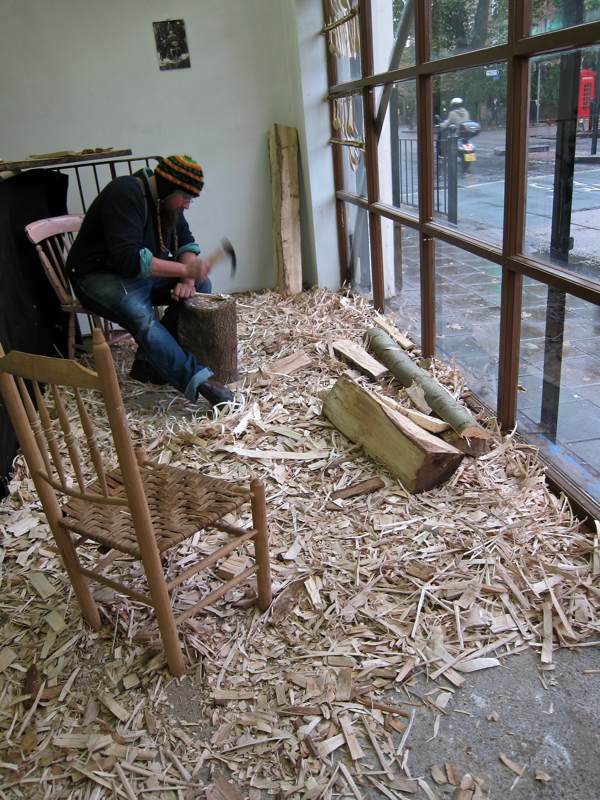 After his apprenticeship, Barn tramped around the shires for three years, carrying his tools in a backpack, sleeping in the woods and carving spoons from timber growing there. “It’s the dignity of being able to make your own living. All I had in my life were my skills, but it has worked out for me.” he confided with a quiet smile of satisfaction. Lacking navigational abilities, Barn walked along canals thereby avoiding getting lost, and ending up in cities where he could find a market for his spoons. After street selling with a pedlar’s licence in the East End, Barn saved enough money to open his tiny shop three weeks ago. 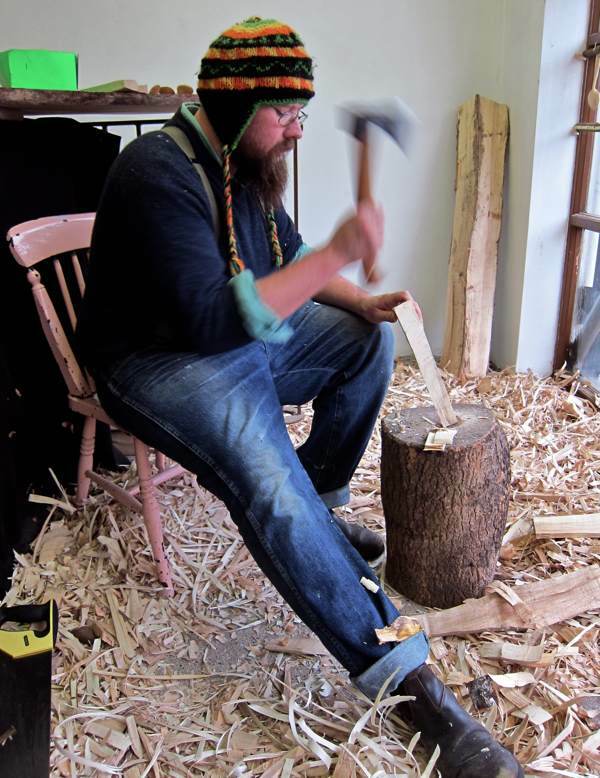 He has found a way to bring his greenwood skills into the city, teaching in a school a couple of days a week and using timber harvested from Tower Hamlets Cemetery Park to make his spoons. 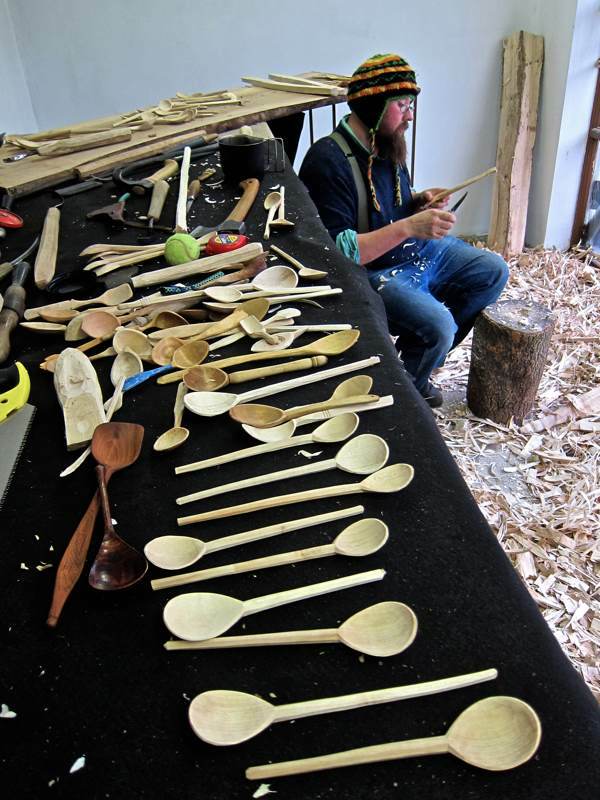 Becoming an evangelist of traditional spoon carving, Barn co-founded Spoonfest an international gathering of spoon carvers each summer in a wood in Edale. oh this makes my heart sing! 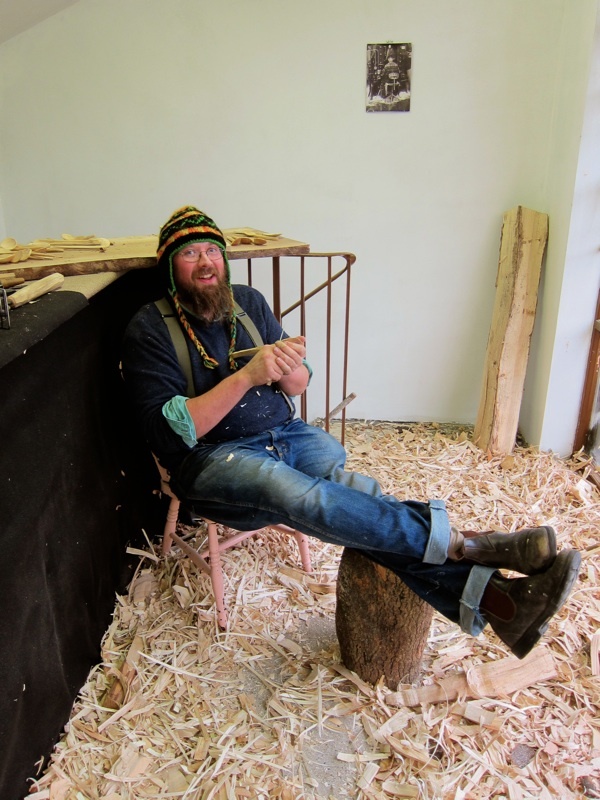 Wonderful article – it is a joy to hear of Barn’s sense of peace with himself, his trade, his ecological footprint – a truly happy person is a hard one to find! What joy this post and how spooky, I’ve just been eyeing up a local wood whittling spoon making course. Must be something in the air! How do we buy them if we don’t live in London? I really must visit Barn the Spoon, as spoons are rather my thing. Whenever I visit a new country, I try to bring back a handmade wooden spoon.It’s a lovely and oddly intimate thing to use it in my London kitchen. Thank you for such a wonderful talk last night and I’m so happy you liked the biscuits. I loved this. Recently saw a man at out local farmer’s market who was carving spoons while his wife sold the produce. I’m printing this story out to take to him. 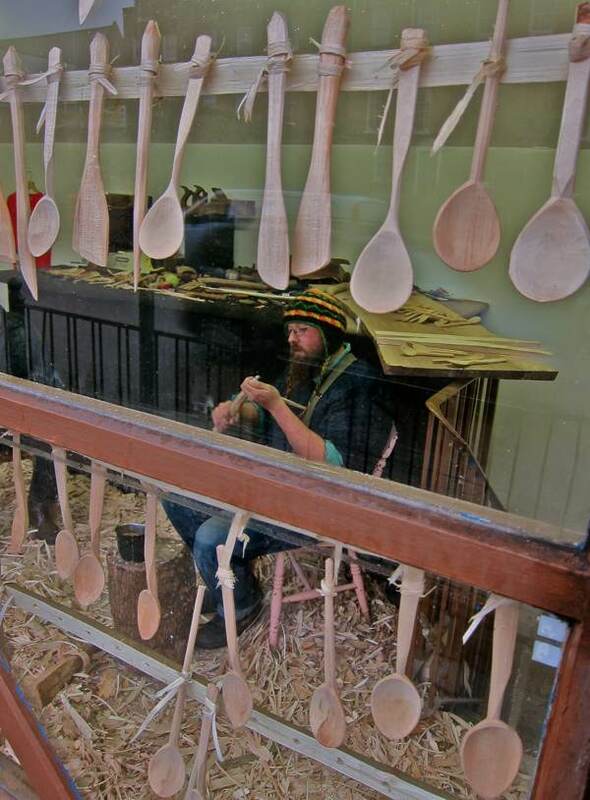 And gee I wish there were a spoon-carving course locally — 75 isn’t too late to take it up, is it? I am coming tomorrow to buy spoons for Christmas presents. What’s the nearest tube station? Bethnal Green and Old St are the nearest tube stations. Thank you for another charming post. I understand that the piece of wood determines the shape of the spoon. Just like a block of marble determines what sort of sculpture it will become. It requires a master craftsman to set it free, like Barn. He sounded a lot less rustic than I expected,which was good! I saw Barn the Spoon in the Guardian Weekend a few months back. He sounds like a real character. Really nice post. Once you have used a Barn spoon nothing else compares, keep spooning. Beautiful post, beautiful character and a truly inspirational story. Thanks for the share! I’m reading this in Cyprus and wishing i could pay Barn a visit. What fabulous products..I wonder if mail-order purchasing is possible? Coming to London in May…gotta visit Barn! Beautiful work. Hi Barn, I bought one of your spoons when you were carving them in Bristol near the museum, about a year ago, I think you said it’s elm, but I can’t remember exactly … I use it every day when cooking my porridge (!) 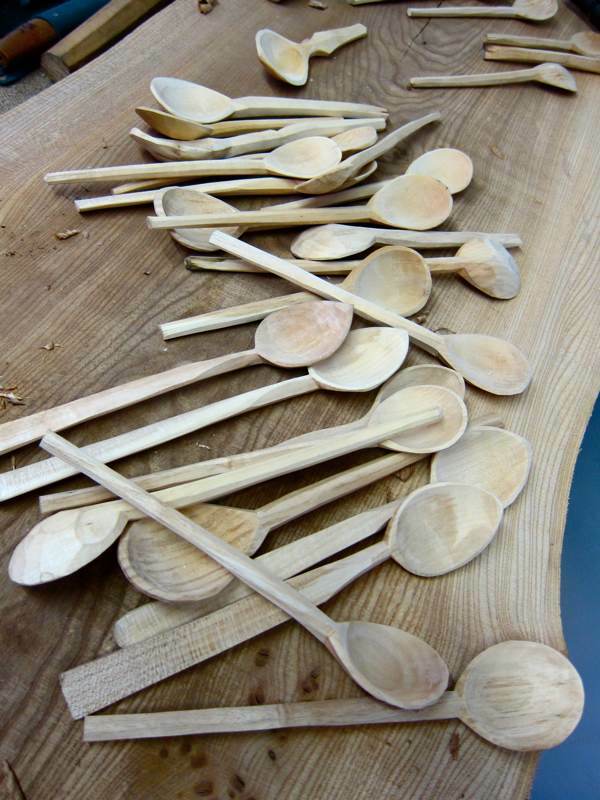 and have just signed up for a spoon whittling course. Lovely to read your website, good luck with your projects. Bran, I loved the video demonstration. I understand having a favorite wooden spoon! 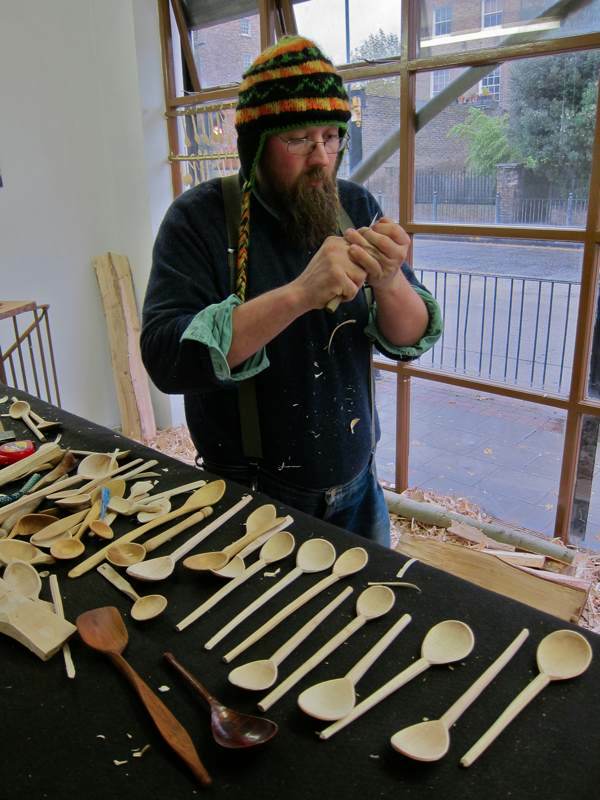 I will be in London in May and would love to purchase one of your spoons. Could you please give me a price range, so I will be prepared! Kay, Barn charges £15 for most of his spoons. Just heard Barney on ‘Midweek, Radio 4′. SO inspiring and refreshing an attitude. I was desperate to see what he and Libby were looking at… beautiful ! The studio looks like a beautiful cocoon… I can imagine the scent and sense of wood is ingrained (sorry)! Following my fathers paternal family line back from London to Northamptonshire, to the small village of Kings Cliffe – once known as the wooden spoon village. Their wares were dispersed around the country via the tinkers who called in to collect, and then moved on. His maternal line lived around Spitalfields and Bethnal Green. 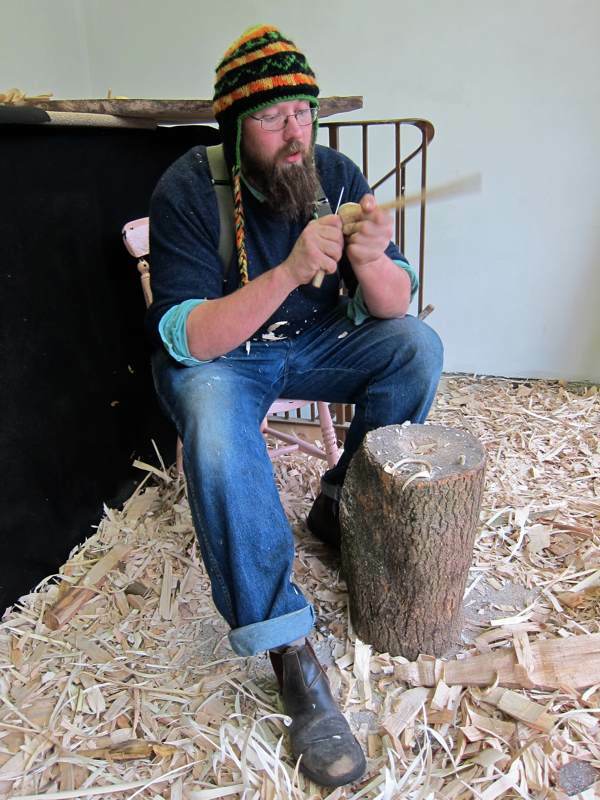 So it was lovely to read and watch the video clip of Barn whittling his spoon.